After a whirlwind but very educational trip to Atlanta for The Special Event Conference last week I headed to Columbia, SC for a friends wedding. The ceremony and cocktail reception took place on the historic horseshoe of the University of South Carolina campus. Cami and Dustin always want to do things a little different so there were a few surprises in store. It started with the invites - The ceremony was to take place at 5:32 in the afternoon! During the ceremony the readings were actually famous song quotes and were read by the BM and MOH. After the newlyweds kissed a friend and musician broke into 'How Sweet it is to Loved by You' while strumming a guitar down the aisle. 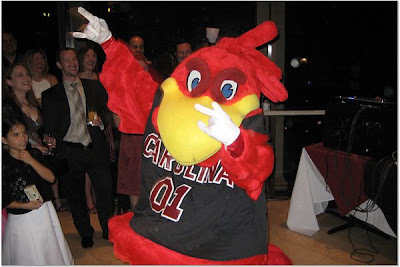 Now that wasn't it - during the reception there was a very special guest - Cocky - The USC mascot joined the festivities and had everyone dancing! Remember a wedding is all about your personalities - its ok to do things out of the norm. Your wedding your way! Congrats to our new married friends - enjoy Jamaica!